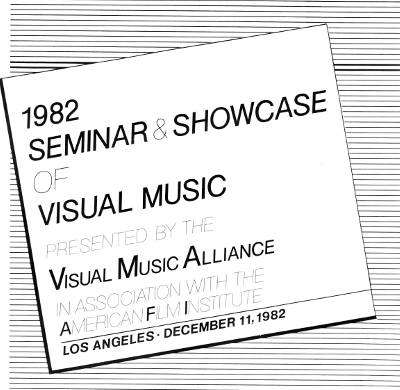 Background: A 1990 brochure stated: "The Visual Music Alliance (VMA) was founded in 1980 by a group of professional film and video artists and musicians to promote the visual/audio media as an art form and to fill the information void on the cutting-edge technological developments that were altering the face of the moving-image arts." The original organization founded in 1971 was called Music and the Arts Technological Center, Inc. In 1974 the name was changed to Music and the Arts Foundation of America, Inc. We have not yet found papers for a name change to VMA. Collection: Newsletters, Correspondence, clippings, papers relating to Incorporation, misc. papers, programs, members' list, cartoons. Above, logos from membership brochure. Provenance: Gift of Fred Parotaud. Other VMA papers exist in CVM's Collection, from a gift of The Fischinger Archive. The Relay, October 1982 (periodical). Cover story: Visual Music Pioneer Oskar Fischinger. Article on Oskar Fischinger by Richard Bohn. An ad notes a Special VMA Presentation of The Works of Oskar Fischinger at The Art Center College of Design, Pasadena, on October 15. Also in this issue of The Relay, a paragraph titled Just What is Visual Music? "Visual Music is a dynamic art form combining visuals and music, which interact to achieve a unique effect that would be impossible with either discipline alone. In its ideal form, Visual Music is an exciting combination of disciplines that is repeatedly viewable, wherein the music and visuals complement each other. This creative combination of form, color, motion and music promises unlimited prospects for artistic expression." Newsletter page, June 1986, announcing upcoming screening with films by Oskar Fischinger, Mary Ellen Bute, Len Lye, Norman McLaren, others. Newspaper Clipping: Calendar section (presumed Los Angeles Times), March 1990. Newsletter page 1, and Page 2, Vol 10, no. 8, August 1990. Article and sketches for "VIdeo Home Dome"
CVM is seeking additional program notes, flyers, and newsletters of The VMA to complete the Collection. Please contact us if you are willing to donate any VMA materials or photocopies of materials to the Archive.